A wireless LAN router (Access point) is required in order to operate a PLUS Copyboard remotely from your device. This app provides remote control of a PLUS copyboard, allowing you to scan and download content wirelessly from the copyboard. Drawings and text on the copyboard are saved in high-resolution, letting you view even the smallest details on your device. 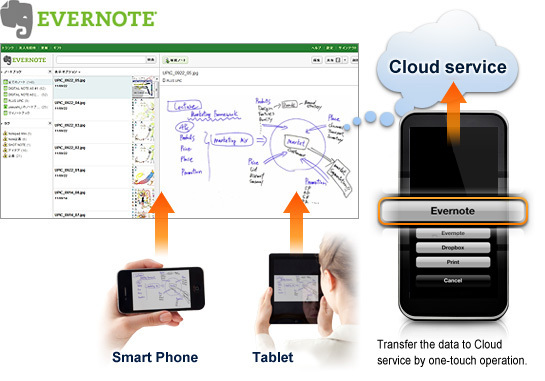 You can also send saved data to others via e-mail, as well as the Evernote and Dropbox services. In addition, not only you can get data from the copyboard, but you can also take pictures, record video, and capture audio, making this industry-first app the perfect tool for capturing everything that happens at meetings. 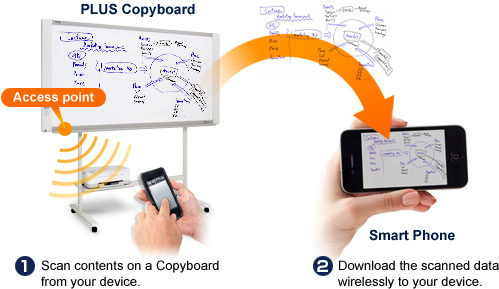 Quickly and easily scan the content of a copyboard and have it sent to your device. You can also perform manual sheet feeds remotely. Record and save both still images and video from the camera in your device. This feature automatically records audio while it's running, and by pressing the Clip button, you can save up to the last 60 seconds of audio to a file. Send images, video, and audio files to others via a variety of methods e-mail, Evernote, and Dropbox are all fully supported. •iPhone, iPod touch and iPad are trademarks or registered trademarks of Apple, Inc.
•Android, the Android logo and Google Play are trademarks or registered trademarks of Google Inc.
•Evernote is a trademark or registered trademark of the Evernote Corporation of the United States. •Dropbox is a trademark or registered trademark of Dropbox, Inc., of the United States.